Great for an overnight stay at Grandma's or just throw some favorite things in it for an easy trip to a restaurant. Lots of room for lots of stuff, and lots of fun for kids! Safari Overnight bag is made of PRESHRUNK cotton flannel, and has coordinating brown cotton lining. Outside pattern has white background with greens, yellows and browns. There are monkeys, elephants and lions on it. Bag is machine washable, and measures 15' wide by 16' high. There is one pocket on each side. They measure 8' wide by 7.75' high. Bamboo-style button closure at the top. 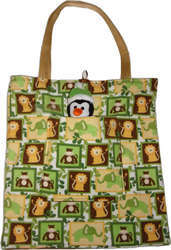 Blue Monkey Overnight bag is made of PRESHRUNK cotton flannel, and has coordinating brown cotton lining. 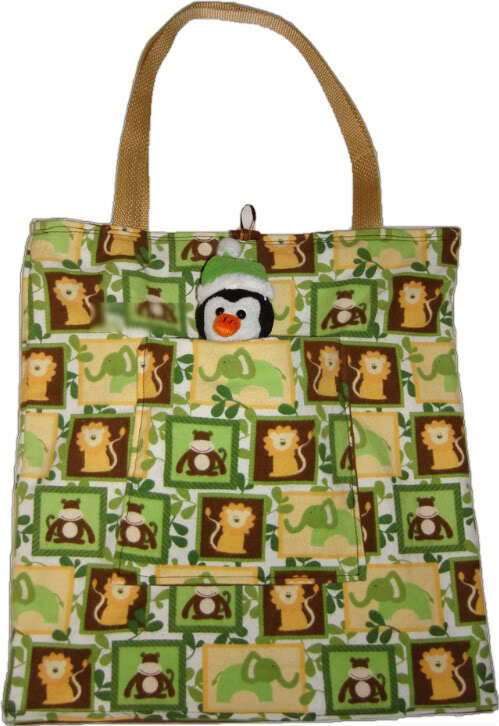 Bag is machine washable, and measures 15.25 inches by 16 inches. Pockets on each side measure 6.5 inches by 7 inches, and they are lined. Golden nylon straps are approx 21 inches. Pink & Polka Dot Overnight bag is made of PRESHRUNK cotton flannel. Flannel is pinky-peach in color,and has purple, lavender, green, yellow, blue and ivory polka-dots on it. Coordinating lavendar cotton inside lining. 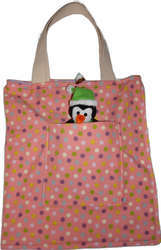 Bag is machine washable, and measures 14.5 inches by 16 inches. Pockets on each side measure 7.5 inches by 7.5 inches, and they are lined. Cotton straps measure approx 20.25 inches.